But I kinda wanted to take things in an entirely different direction because I cant resist a good lemon blueberry anything. So I wanted to whip up one of my favorite cakes and share it with you. Have you ever heard of the old-fashioned 7UP Cake? That was one of my favorite cakes growing up and I still make it so many times to this day. I decided I wanted to add some blueberries to the mix and give it a little different flavor and it has fast become one of my go-to cakes any time of the year. Grease and flour a 10 cup bundt pan, set aside. In large bowl cream cream together butter and sugar until well blended. Add in your eggs one at at time until incorporated. Next add in flour and beat until well combined. Add in your lemon extract, 7up and lemon zest and beat until blended. In another bowl add your blueberries and flour and toss to coat then fold them into your cake batter. Spread cake batter into prepared pan and bake for 1 – 1 1/2 hours until center is set. Meanwhile to make your glaze in bowl add your powdered sugar and lemon juice and whisk until combined. When cake is cooled, turn out onto serving dish and drizzle with glaze. 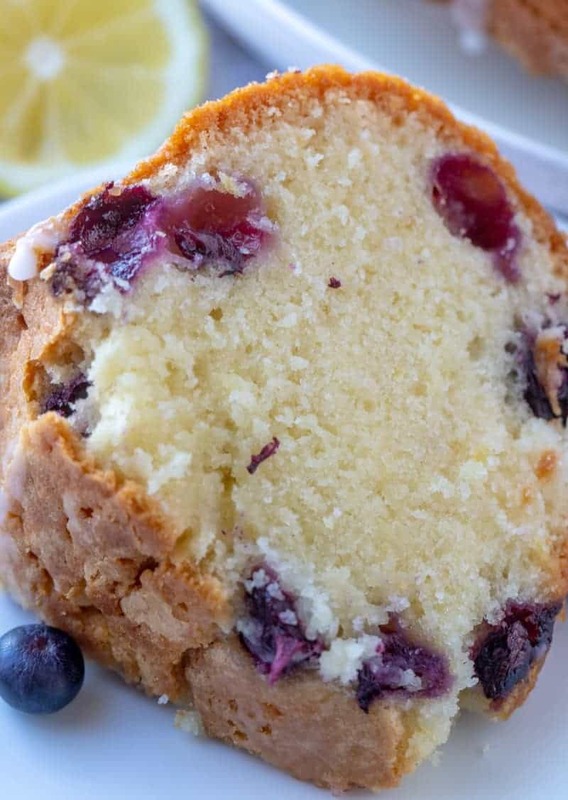 This blueberry cake couldn’t get any more simple. The majority of the cake is made in one bowl which saves time on clean up. It really packs just the right amount of lemon to blueberry flavor. 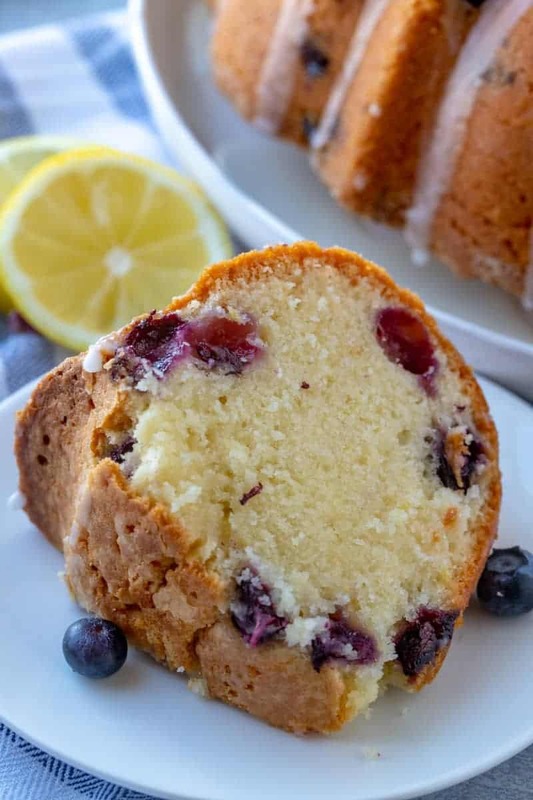 Also I love that this lemon blueberry cake is made in a bundt pan, I love bundt cakes so much because they are usually so simple and easy to whip up. My kids love that this cake includes 7up, they think it is so fun. I have some non-blueberry lovers in my house unfortunately so we do leave the blueberries out of this recipe quite a bit and it turns out amazing. 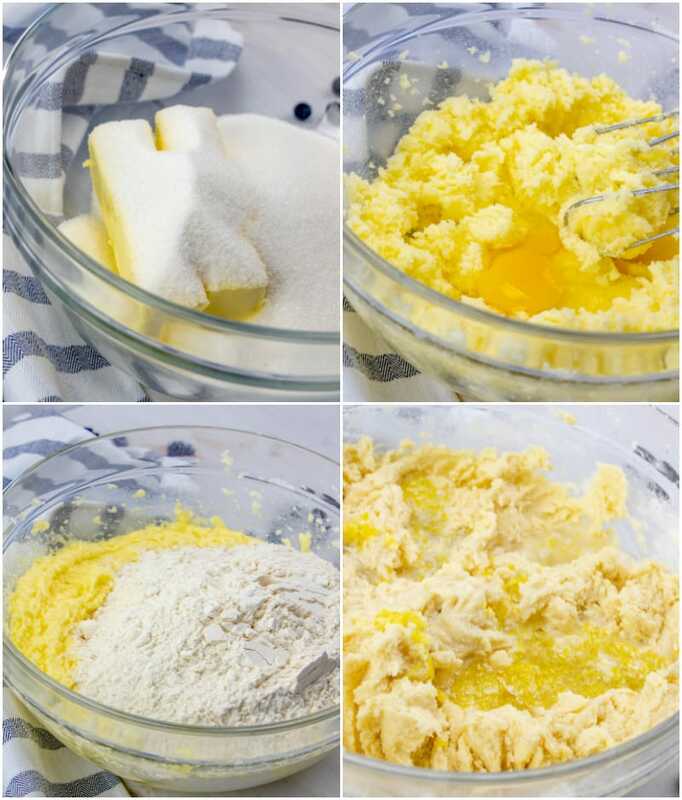 Grease your bundt pan with shortening and sprinkle with flour. This has always been something I’ve done with my bundt pans and usually they come out of the pan clean each time. Adding flour to your blueberries helps them to not sink the the bottom of the batter so you will have them evenly spread out. You don’t need any baking powder or soda in this recipe, the carbonation in the 7up acts as a natural leavening agent. Ovens vary in temp, check after 60 minutes with a toothpick and start checking ever 10 minutes from there. Mine takes a whole 90 minutes to bake fully. Poke holes over the top of the cake and drizzle with a lemon syrup to soak up inside for a more intense lemon flavor. Switch up your fruit to blackberries or strawberries to have a different flavor profile. 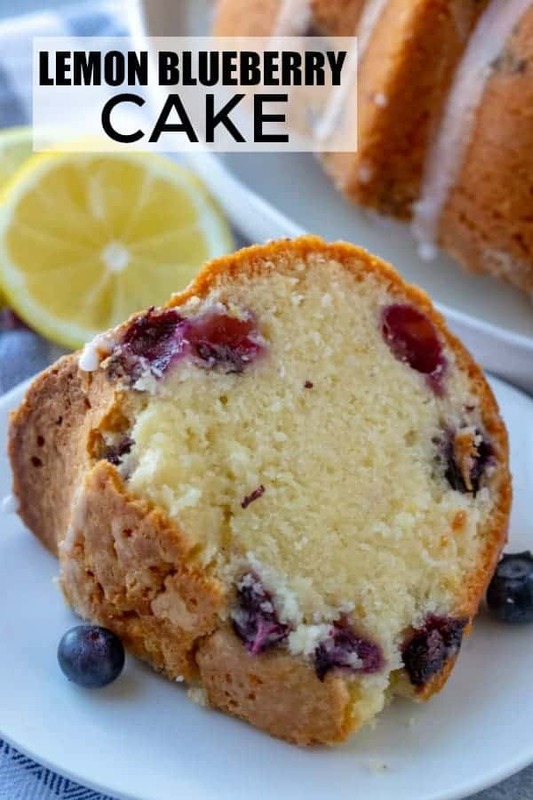 If you want a light and fresh cake then you really don’t need to look much further than this Lemon Blueberry Cake. It is simple, tasty and feeds a crowd. The perfect cake to bring to any gathering or when you want something that will last a little while, unless of course you are like me and are addicted to cake, in that case make two! Spread cake batter into prepared pan and bake for 1 - 1 1/2 hours until center is set. Lemon and blueberries are just meant to go together! This looks so delicious! I love the addition of 7up to the recipe…what a great idea! This was absolutely amazing! My kids loved it! 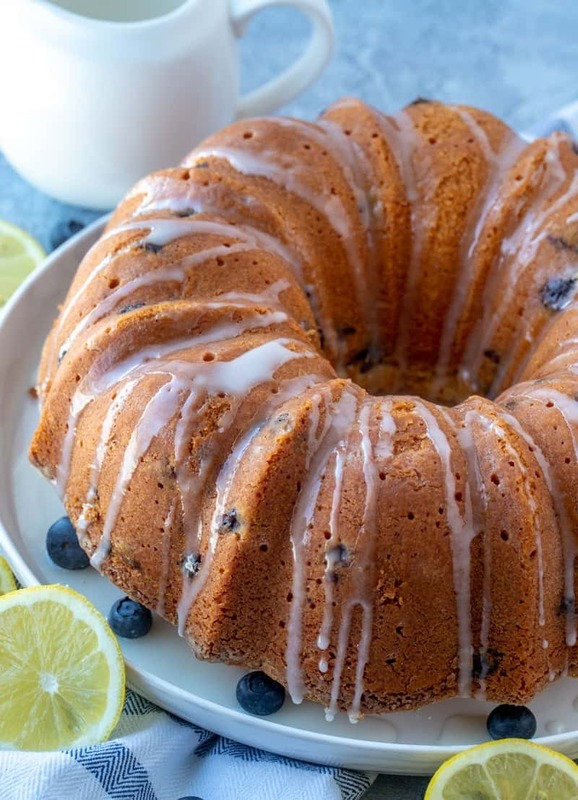 I love lemon and blueberries together and in this cake, they’re like a match made in heaven. It’s so good! 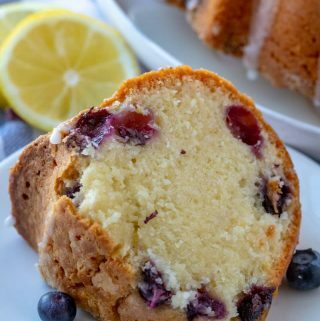 I have tried many times to make a lemon blueberry bundt cake. Every recipe turns out dry. 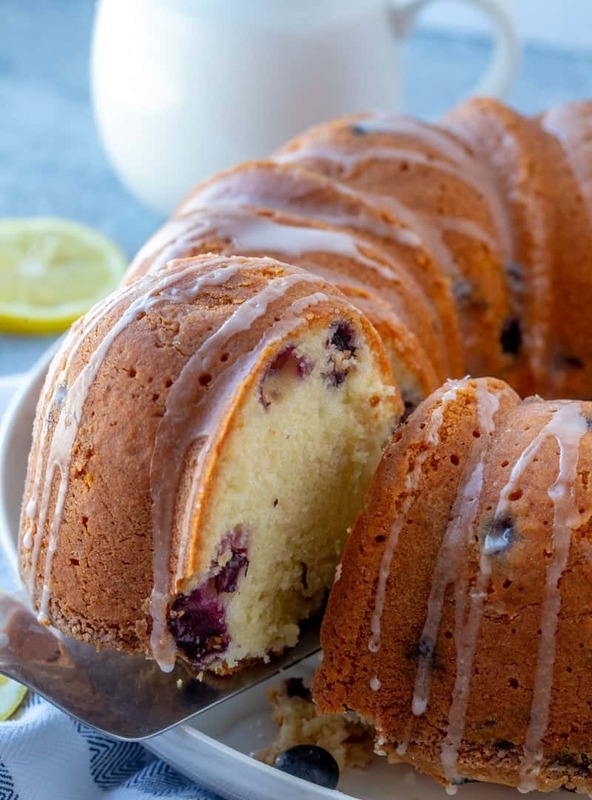 My mom use to get a bundt cake kit that had wild blueberries and a lemon glaze. I want that memory. I will try yours. Thank you. I have had that problem with some cakes I’ve made too, we love this recipe! Usually turns out moist for us with no issues at all! The texture and taste of this cake is amazing! I couldn’t stop sampling it!! I just made this tonight and it’s BEAUTIFUL!!! So delicious!!! Sheryl I’m so happy to hear that!! We adore this cake so much so happy you liked it! Why in did ingredients it doesn’t say lemon zest.